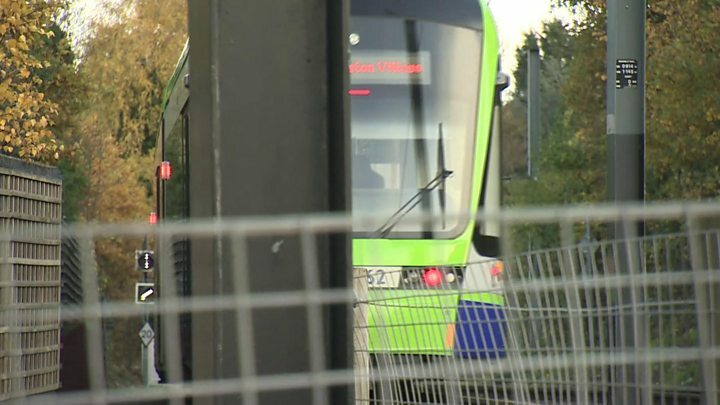 A tram driver has been suspended after footage in The Sun appeared to show him struggling to stay awake, transport company FirstGroup has said. A video emerged of the driver at the controls on the same line on which a crash killed seven people in Croydon, south London, on 9 November. The Sun said it had been recorded in April, about three miles from the derailment scene of the derailment. FirstGroup said the driver had been removed from duty pending an inquiry. He is not the same driver involved in last week's fatal crash. A spokesman for the company said: "We have not seen this video before (we saw the footage for the first time when the Sun sent it last night) and it will now be subject to a full investigation. "If the situation is as it appears, then this is completely unacceptable and appropriate action will be taken." In a 30-second clip the driver appears to struggle to stay awake as the tram moves forward. He is seen apparently struggling to remain upright as passengers are heard expressing shock as the tram approaches the next stop. Mayor of London Sadiq Khan said he was "extremely concerned" by the footage. The BBC has not been able to verify the footage, but Transport for London (TfL) said it was also carrying out urgent inquiries. A TfL spokesman said it had asked operators FirstGroup to take all necessary action and report back as soon as possible. Crystal Palace and Manchester City fans fell silent ahead of their Premier League fixture on Saturday as they paid tribute to the victims of the Croydon tram crash. Both sides and their supporters observed a minute's silence in honour of the six men and one woman killed in the tragedy on November 9. Two of the victims - Dane Chinnery and Philip Seary - were Crystal Palace supporters. In addition to the tram crash victims, the supporters also remembered Harry Davies - a 19-year-old Crystal Palace fans who passed away last month. The derailed tram was carrying about 60 passengers. An interim crash report found it was travelling at 43.5mph in a 12mph zone. It found no evidence of any track defects or obstructions. The seven people killed in the crash were Dane Chinnery, 19, Philip Logan, 52, Philip Seary, 57, Dorota Rynkiewicz, 35, and Robert Huxley, 63, all from New Addington, and Mark Smith, 35 and Donald Collett, 62, both from Croydon. A further 51 people were taken to hospital, eight of them with injuries described by London Ambulance Service as serious or life-threatening. The driver of the tram, Alfred Dorris, from Beckenham, south-east London, was arrested on suspicion of manslaughter and released on bail until May.